there are some benefits to living in alaska, not the least of which is knitting nearly year round :) and the infamous dividend. one such benefit came when my mother-in-law katie, found advertised in the local newspaper raw qiviut. 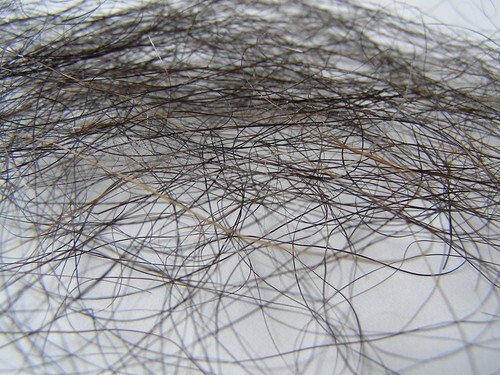 qiviut is the hair of the musk ox. katie bought 1 lb off of a graduate student who, while studying birds on the tundra, picked it up off of the ground where it landed when the oxen molted. apparently, there was a herd that hung out on the tundra where he did his research. katie took it to the weaving/spinning shop in town and was told that we needed to remove the lightweight and heavyweight guard hairs and so she got to work. 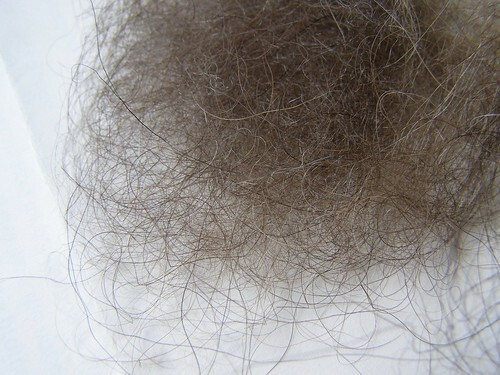 lightweight guard hairs – picture showing the different colors here. these can be mixed with merino. the current plan is a pair of mittens. heavyweight guard hairs – here’s a picture with a bit of down we plan to go back and rescue. we are unaware of anything you can do with these. katie bought the book arctic lace and did a bit of research on her own. 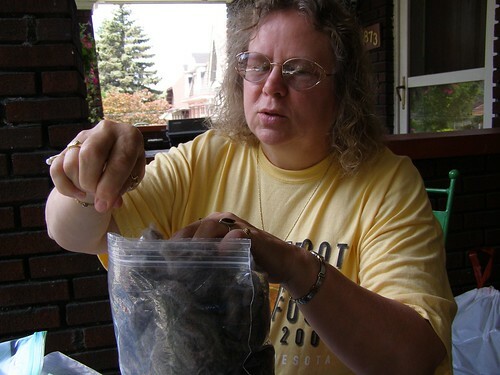 she found out that qiviut can be processed by someone else, but you need 600 lbs of it!! if you know anything about the price of qiviut, you might know that most people could never afford this much and frankly, i’ve no idea who has this much to begin with. the soft, downy coat is even too fragile to be carded by hand, and so she sorts it. 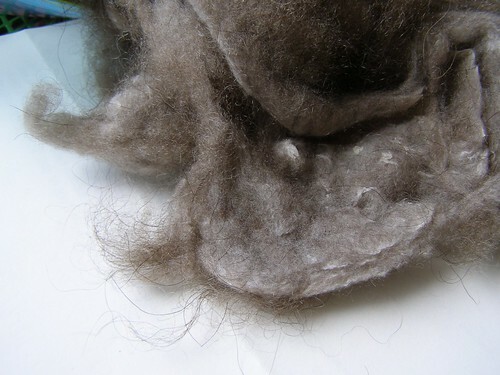 downy undercoat with lightweight guard hairs. so – it’s slow going, but she is enjoying the work. the goal is lace and so today we ordered her a featherweight spindle to practice spinning lace weight with some merino. 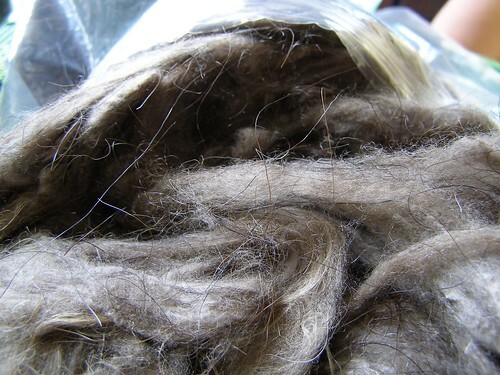 supposedly qiviut is 8 times warmer than wool and will be perfect for smoke rings and the such. you may remember how much katie likes smoke rings from my intro to this pattern. i love that there are fibers warm enough that holey knitting is even super warm. a bulky qiviut would be near unwearable. there are more pictures in my photostream and i would highly recommend clicking the little button above the photos that says all sizes to get the idea. personally, i just want to climb into the bag of down. 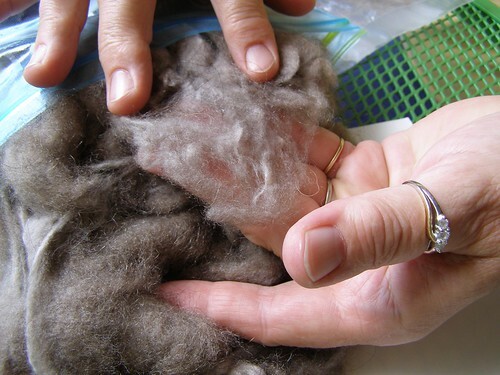 here’s a good article telling you a lot more about it as a knitting fiber, if you’re interested. This looks wonderful to touch! Is it really really soft as a dream? I have a qiviut gaiter–see Arctic Lace–and when I am wearing it my neck and lower face are *warm* in the winter for the first time ever. It’s so light I can easily breathe through it when I’ve pulled it up over my nose and mouth, the moisture from my breath does not condense on the inside much at all (so much less than with a regular scarf), and I’m not sure how I got through winters without it. I’m in a place with moderately easy winters, with some good, hard snaps in which I’ve tested it, but I’ve lived in places with fierce winters. Katie will love a bit of qiviut down lace in the winter. It looks like sorting through it will be totally worth it. Is she just having to pull out individual hairs by hand? Healing thoughts go your way for katie. I happened upon your website looking for a pair of qiviut mittens, but none to be found. When katie is well, I wish her lots of energy to process the yarn and make something that will be a family heirloom. I have a qiviut hat from the oomingmak coop, and cherish it every time I walk my wonderful dog at 10 or 15 degrees out! Wellness to you and your family from Anchorage. It is a lot of work to comb, clean, card, and spin the qiviut, but at the end it is worth it. There are places where you can send some qiviut and doesn’t have to be 600 lbs of it. When i am sending some qiviut i usually send it to Still River Mill. They do a very good job of spinning, you can even send a sample of how thick you would like your yarn spun. wow! thanks for the tip. we might at least get them to de-guard hair it for us.